The big Japanese manufacturers dominate the digital piano market. Can the MPD1600 compete? A versatile and well-featured digital piano that offers plenty for the money. Well worth a test. 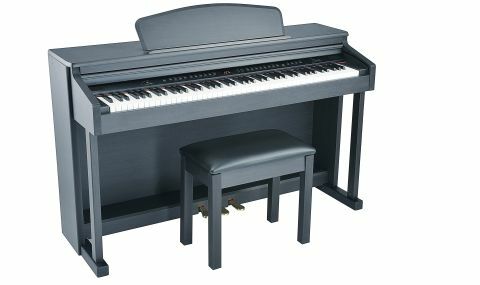 Like many digital pianos, the Chinese made MPD1600 comes in two huge boxes, one for the piano and one for the stand/stool. It weighs in at a backbreaking 70kg (150lbs) so make sure there is a least one other person around when it's delivered, though Gear4Music do offer a two-man delivery service for a little extra cash. Building the stand and attaching the piano is thankfully straightforward and the manual explains things well. The MPD1600's construction is sturdy, combining a mixture of good quality plastics with a main body made of particleboard and covered with a fake rosewood veneer. There are no rough edges and it feels like a quality instrument in general. The 88-note weighted keyboard feels surprisingly good too- often at the lower end of the market you find nasty feeling keybeds but this one feels very well balanced for all playing styles and ages and it's not too light or too heavy and can be played fast and accurately without fearing for the health of your wrists, fingers or arms! Three velocity curves are also included to cater for different styles of player and a soft pedal, sostenuto and sustain pedal is included with the stand, just as you would expect on a real piano. Power is via a wall wart, though a proper kettle connector would have been sturdier. Round the back are connections for Midi in and out and a 1/4" jack output. Two headphone jacks can also be found under the keyboard for silent practice, or playing duets without annoying everyone else in the room! The MPD1600 has 128 GM sounds onboard which cover a lot of ground stylistically. Sure, they won't set the world alight but they are of a uniformly good quality at the price point. The acoustic piano sounds onboard are good with plenty of clarity, warmth and bite and there are some very playable orchestral/synth strings too, along with acoustic instruments, synth basses, electric guitars, plus sound effects and drums. Everything a beginner to advanced player could want is here and the onboard speakers are certainly loud enough for in the home, though there's no onboard eq. The 17 onboard effects (choruses, reverbs, delays, flangers) are also a useful addition and sound good. Voice selection is very easy and can be done according to category, or you can scroll through all 128 sounds at once, whilst splits and layers are also possible and easy to setup for accompanying yourself, practicing and playing along with others. There's a metronome onboard too, along with 40 rhythms with auto accompaniment for jamming and practicing, with enough preset styles to cater for most tastes. These are well done on the whole and to top things off, there's a handy 2-track recorder for recording song ideas. It's all very well thought out and easy to use in general. This piano certainly holds its own in terms of sounds and features and will fit well into most homes. Importantly it plays really well and as a bonus it also comes with a very comfy matching stool. Definitely check it out next to its Japanese equivalents if you are in the market for a versatile digital piano that won't break the bank.